To be honest it is hard to know where to begin this story. I feel like the important details are not so much how my husband and I got to shake Pope Francis’ hand (although having a Pope Hand is pretty awesome), but more so the lesson the Holy Father taught us in brief moments we shared with him. My husband and I were married on October 5th in my hometown of Memphis, TN. It sounds cliché to say this, but it really was the happiest day of my life. After 3 years of working with engaged couples at my parish and teaching the Theology of the Body, it was wonderful to enter into the Sacrament of Marriage with my best friend, surrounded by our family and friends. God is so good! Before we were even engaged, Michael and I knew that we would be going to Rome in October for our last Graduate Theology course. Rome itself is an overwhelming experience. Standing in basilicas that were built more than a thousand years before our country was founded gave me a deeper appreciation for our faith. One of my favorite places was St. Peter’s Basilica. The moment we stepped into the building it felt like home. The artwork was breathtaking, and the architecture impressive; but what made that basilica feel like I was standing in my home parish was the realization that this is where the foundations of our Catholic faith were laid. It gave a whole new meaning to “You are Peter, and upon this rock I will build my Church, and the gates of hell shall not prevail against it” (Mt 16:18). On October 16th my husband and I attended the papal audience in St. Peter’s Square. 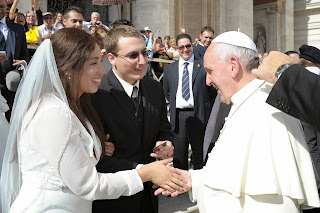 We were able to obtain Sposi Novelli (Newlywed) tickets, which meant that we were invited to wear our wedding attire to the audience and sit in a special section that was a little bit closer to the Holy Father. Our seats were surrounded by barricades and we were several rows back in our section, so we assumed that we might get to see the Pope from 100 feet away, or if we were really lucky he might come down our side of the barricade to wave hello. No matter what happened we were grateful for this experience. After the Holy Father’s address, the Vatican security guards instructed us to file out of the section. I assumed that meant everything was over now and it was time to go home. And then we realized they are taking us to Pope Francis! They looked at each couple, making sure the men had their jackets buttoned up appropriately, and that the women had the proper attire. It was one of those moments where we could not help but see how God placed us in the right place, at the right time, and before we knew it we were standing at the center of the platform waiting for the Holy Father to come and greet us. It is hard to put into words the thoughts and emotions we experienced when we saw the Successor of Peter standing right in front of us. As the Holy Father shook Michael’s hand I said (in Spanish) “Holy Father, we are from the United States. 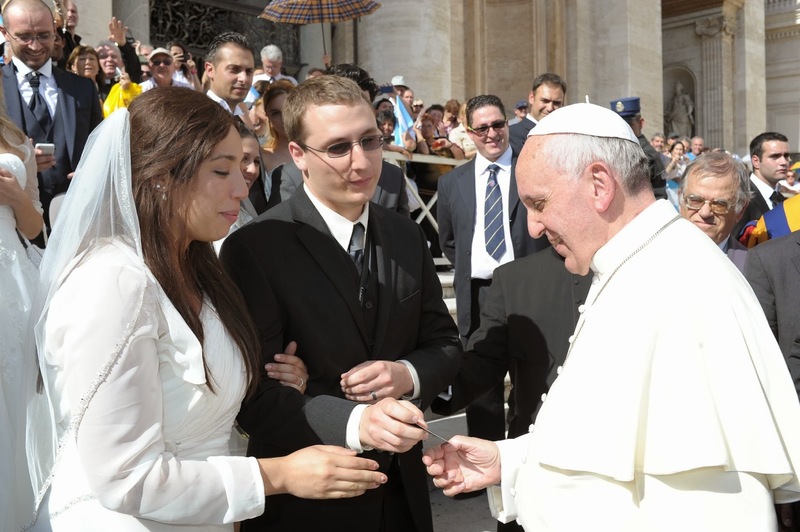 We are praying for you.” Pope Francis shook my hand, and then Michael handed him a holy card that we had given to our wedding guests which has a picture of the Divine Mercy. I told the Holy Father, “This is a gift from our wedding. We were married on October 5th, the feast of St. Faustina.” Pope Francis looked at both sides and smiled, and then he made his way to the next couple in line. Michael and I stood there for a moment a bit awestruck at what had just happened. There’s one thing that struck me more than anything else about our brief moment with the Holy Father: He knows the gift of presence. When I think about our wedding reception and brief moments I was able to spend personally greeting our guests, I have to admit that I probably was not as focused on each person as I should have been. Sometimes all I could do is blurt out a quick “Thanks for coming! It’s great to see you!” before running back to the floor for another favorite song. And then I think about our moment with Pope Francis. The Pope had to have greeted hundreds of people before he came to us. He wasn’t just shaking hands and kissing babies because of some kind of obligatory Papal Duty; rather, he greeted each person, he looked at each one of us like a father lovingly looks at his children. Even though he didn’t say a word, he listened to us. He looked at us. He smiled at us. In that moment he was present to each person, sharing the love and joy of Christ even if it was only with a smile. Looking back at the pictures that were taken of us with Pope Francis it is still hard to believe that we were able to experience something so special. The Holy Father gave us just a few seconds of his time, but he taught us that sharing the joy of our faith can be as simple as being joyful and fully present to each person we encounter. That is probably one of the best gifts that we could ever receive as we begin our life as a married couple. Lord teach us how to be present to every person we encounter, and teach us how to be see the gift of each and every person we meet.